Unlike most exhibitors who are showing of the latest and greatest fishing and hunting gear (some of which I bought), the Scarborough Fly and Bait Casting is selling something quite a bit different. As a grassroots angling club, our product is us. Anytime Jurgen our Fly Tying Master was at the vise, people soon crowded around in amazement at his life like creations and more than a few offered to buy his amazing fly patterns. New member Paul, who has built one of the nicest fly rods this member has ever seen, was equally as passionate in sharing his experiences in making his first ever split cane rod. In fact people were so interested in our rod building display that we even had an offer from a local cultural museum to run a seminar on bamboo rod making. Jurgen ties flies (left) , while Jeff, James and Ray tell lies…about the size of fish they caught or nearly caught. 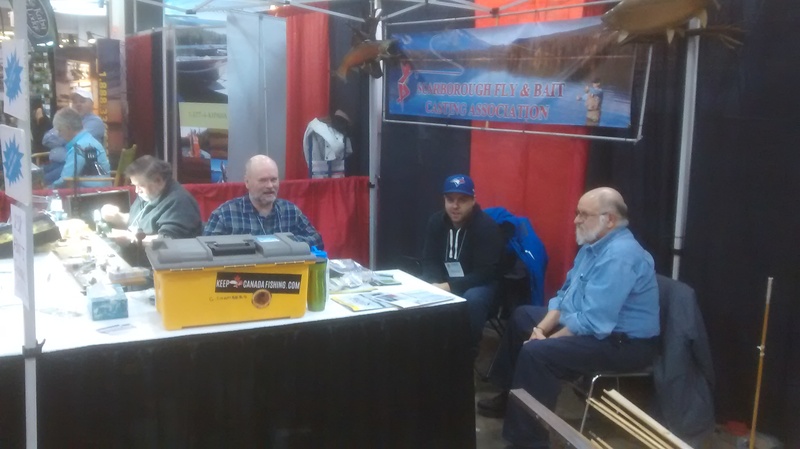 At the end of the day, the Scarborough Fly and Bait Casting Association engaged with hundreds of show attendees. We preached the message that fishing is a great sport that the whole family can do together and that it doesn’t have to cost an arm and a leg . Overall our message was well received resulting in 30 new inquires about joining the club. 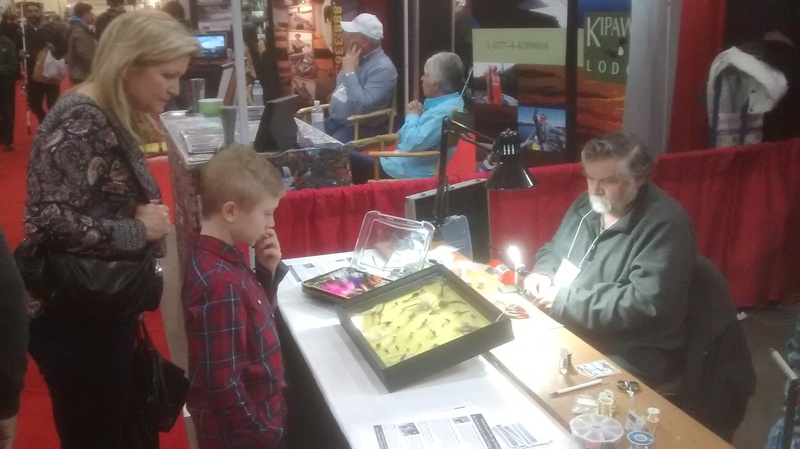 This entry was posted in Events, Toronto Sportsmen's show, Uncategorized and tagged 2018 Toronto Sportsmen's Show, fly fishing, Fly Tying, Toronto Sportsmen's show. Bookmark the permalink.